Mercedes-Benz World has welcomed its first Hemmels motorcar for display at its facility in Weybridge, UK. 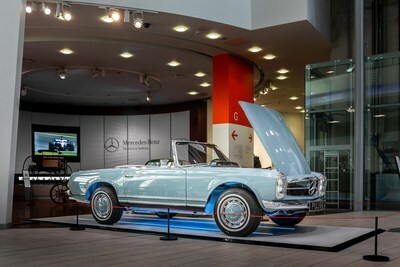 The motorcar, a 1968 280 SL "Pagoda" is prominently featured in the main reception area. The restoration was commissioned by British racing car driver Paul Rees who chose to finish the car in its original Horizon Blue paint colour with a new Navy Blue leather interior. Estimated at a value of £285,000, the restoration was completed at Hemmels' bespoke facility in Cardiff, commencing in late 2016 and taking over 4,000 labour hours. "Mercedes-Benz World has a fantastic display of classic and rare along with interactive exhibits and driving experiences. Establishing a centre of this calibre is complementary to the vision and commitment to excellence of this marque," said Joseph Sullivan, MD Hemmels. "We're proud to have the first of hopefully many motorcars displayed this prestigious facility." Offering a new car buying experience, Hemmels' clients can order a Mercedes-Benz classic car in the colours of their choice along with bespoke options and preferences. Hemmels then restores the cars according to the exacting standards of its trademarked Neugeboren ("newborn") Process where every car is fully dismantled and rebuilt from its bare metal beginnings over a 52 week period. Like a new car purchase, a full 12 month parts and labour warranty is included along with servicing options. Hemmels is pleased to welcome interested parties for a personal tour of the showroom and facilities through prior appointment. The company will be displaying a selection of its classic cars at the London Classic Car show, ExCel Exhibition Centre, London, UK from February 14th-17th, 2019. Hemmels restores classic Mercedes-Benz SL motorcars to client specification specialising in the iconic 300 SL Gullwing, 300 SL Roadster, 280 SL Pagoda and 190 SL Roadster models. Offering a new car buying experience, clients order a classic car in the colours of their choice along with a selection of options and preferences. Hemmels restores the cars according to the exacting standards demanded from its patented Neugeboren ("newborn") Process where every car is fully dismantled and rebuilt from its bare metal beginnings. With a purpose-built facility and over 40 staff, Hemmels completes up to 30 restoration projects per annum at its Cardiff, UK headquarters.